Mumbai's Metro Rail will be sleek, modern, and beneficial to those who can afford it. But is it worth the cost? Photo: Madhav Pai, Technical Director, Centre for Sustainable Transport in India. Carrie Denning recently spent time living in Mumbai and working with Bombay First to explore how the Mumbai metro can raise revenues beyond the fare box. She is currently a Lokey Fellow at the Environmental Defense Fund specializing in transportation policy. She is a contributor to EDF’s transportation blog, Way2Go. The Mumbai Metropolitan Regional Development Authority (MMRDA) is in the midst of building a metro system to serve the metropolitan region’s 17.7 million people. Egged on by the success of Delhi’s metro (and not withstanding its failures), MMRDA wants a fast, sleek, and clean metro to improve transit for its citizens and make a statement to the world. The 146.5-kilometer system will be a network of ten corridors constructed in three phrases for a cost of Rs. 195.25 billion (approximately $4.25 billion). The official foundation stone was set in 2006. Metro systems require huge capital investments and are rarely considered financially viable without large government subsidies in order to keep fares low. 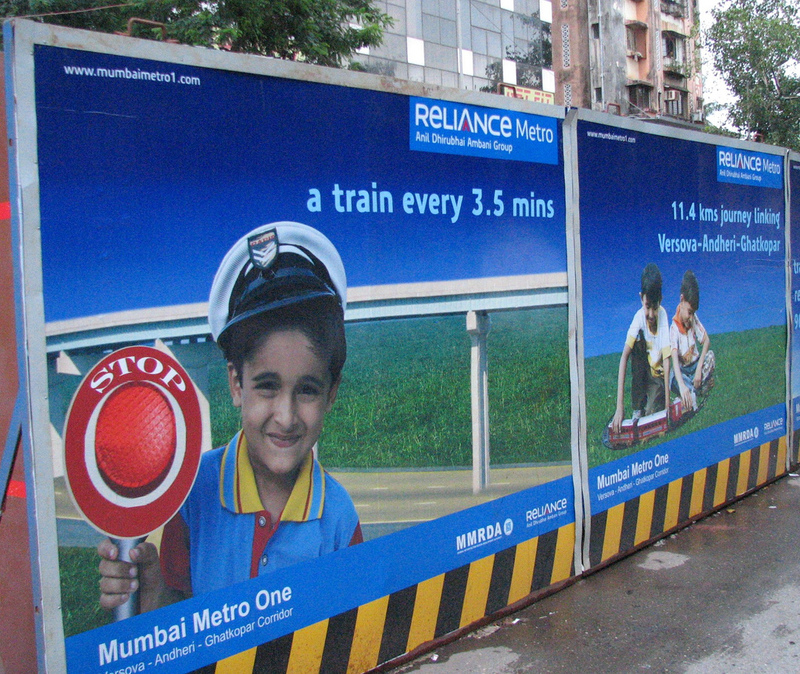 Mumbai’s metro is costly and is geared towards a wealthier slice of the population. If MMRDA wants to get the most bang for its buck in terms of capital cost per route-kilometer, a metro system may not be the best transportation alternative. For example, the Colaba-Bandra corridor – a 20-kilometer stretch of the system that connects the southernmost tip of the Island City to Bandra – is estimated to cost 14% more than the entire first phase of the Delhi metro. Additionally, Mumbai plans to charge 1.5 times the fare price of the BEST bus system. While 52% of citizens take some sort of public transportation, approximately 25% of the population is priced out of any form of transit and must either walk or bicycle.1 This increase in fare costs will shrink the pool of eligible riders, and actual ridership numbers are generally 39% lower than predicted ridership.2 The Delhi metro, for example, only achieved 21% of initial estimated ridership.3 Based on the Mumbai Metro’s staggering costs and its inaccessibility to lower-income travelers, the city’s money may be better spent elsewhere. However, Mumbai desperately needs a transportation fix. Though only 30% of the Indian population can currently afford a Tata Nano, that number is rising and congestion on Mumbai’s streets is an economic burden as well as a serious mobility problem. The number of vehicles on the streets increased from 61,000 to more than 1.02 million in the past four decades. Conditions on the suburban rail network are crowded – 4,500 passengers travel on trains with carrying capacities of 1,750 – and dangerous – approximately 4,000 passengers per year die while commuting. Additionally, the metro area’s inadequate road network slows traffic, causing chronic road congestion & pollution. Clearly, the system is overburdened. With the right approach, a metro could help improve the mobility of the growing middle class and lessen the expected influx of automobiles. If Mumbai does go ahead with its metro system, which it appears to be doing, policy makers must also adopt an aggressive sustainable transportation campaign that focuses on reducing vehicle miles traveled and improving the mobility of pedestrians and cyclists. They should also explore congestion pricing and the taxation of vehicles and vehicle externalities. Moreover, it is crucial that the authorities support other forms of public transit, which 88% of the population relies on. MMRDA should upgrade the BEST buses by enlarging the fleet of compressed natural gas (CNG) buses and add basic amenities like air-conditioning. MMRDA should also enforce traffic management to improve circulation, and prioritize improvements for pedestrians and cyclists, who make up over a third of all trips. With scarce resources and a growing population that is bursting the seams of the city’s transportation infrastructure, Mumbai’s leaders must take a comprehensive approach to transport. If the MMRDA does not make improvements to the system as a whole, the Mumbai Metro Rail project will be a massive capital investment without a substantial impact on human mobility. 1Pucher, J., N. Korattyswaropam, N. Mittal, N. Ittyerah. (2005). Urban transport crisis in India. Transport Policy, 12, 185-198. 2Flyvbjerg, B. (2003). Megaprojects and risk: an anatomy of ambition. Cambridge: Cambridge University Press. 3Comptroller Auditor General. (2008). PSUs – Implementation of Phase I of Delhi Mass Rapid Transit System by Delhi Metro Rail Corporation Limited. Union Audit Reports, Performance Audit Report-17 of 2008. https://cag.gov.in/.